With Hannah’s 6th birthday on Friday 13 May (which necessitated a shopping trip to Upington for a bike), new boats to get used to (the amazing Fluid “Big Bang”) and lots of organising logistics and re-stocking to do we decided to put ourselves under pressure and do 6 days of cycling in 4 in the last week. From Vanzylsrus we did big mileage every day and after 3 long hard days and a good night’s rest in Noenieput (where we were taken in by an amazing missionary couple) we finished off with a 155km day. It was completely surreal to ride into one of our favourite camping spots (Khamkirri) on the banks of the Orange River after a total of 2 970km of cycling since leaving Kosi Bay at the beginning of April. What an incredible milestone and what a relief to have a break from my bicycle seat! We have had a very busy week paddling our new boats on the very rapidly flowing river, packing supplies for a couple of weeks on the river, organising a birthday party for Hannah etc. We had a malaria scare and some very anxious moments when she woke up on her birthday with a high fever and bad headache, but after the trauma of blood tests we are greatly relieved that all is well with her and she is now much better. 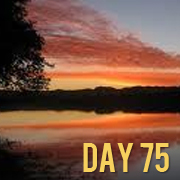 The river has dropped slightly in the few days we have been here but is still flowing very strongly and we are hoping to complete the approx 600km to Alexander Bay in 10 days instead of the planned 15. Danie van Zyl from Khamkirri and Hennie Roos, a friend from East London and a very experienced paddler, will be joining us on the river for the entire trip. We hope to be done paddling by 24/25 May after which we will immediately begin the long run home from Alexander Bay along the West Coast and via Cape Town. We are really sad to be leaving Khamkirri and the incredible friends and great hospitality we have experienced here – a huge thank you to Gawie Niewoudt and Phil and Danie van Zyl for everything they have done for us during our stay at Khamkirri. We will be back! Must be very exiting adrenalin and all reckon you must be close to the Keboes campsite. High tide for you all. 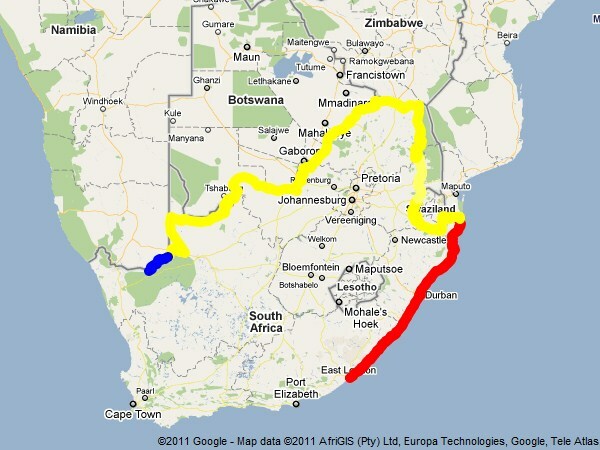 Amazing to see the yello line on the map showing your progress has now been replaced by the blue line paddle – INCREDIBLE riding effort all round, especially the last few days! Well done! Enjoy the paddle! We have been following your progress all along and keeping you in our thoughts and prayers. You’ve doen great girl – we can’t wait to welcome you back on Nahoon Beach. Orange River is great – the whole family did the paddle thing last year and it was a great experience. Some friends of ours at Vredendal would love to treat you to some Mosselpotjie, so I’ll keep them informed about your progress. Best wishes from all here in “Slaapstad”.